In ikat the resist is formed by binding individual yarns or bundles of yarns with a tight wrapping applied in the desired pattern. The yarns are then dyed. The bindings may then be altered to create a new pattern and the yarns dyed again with another colour. This process may be repeated multiple times to produce elaborate, multicolored patterns. When the dyeing is finished all the bindings are removed and the yarns are woven into cloth. In other resist-dyeing techniques such as tie-dye and batik the resist is applied to the woven cloth, whereas in ikat the resist is applied to the yarns before they are woven into cloth. Because the surface design is created in the yarns rather than on the finished cloth, in ikat both fabric faces are patterned. 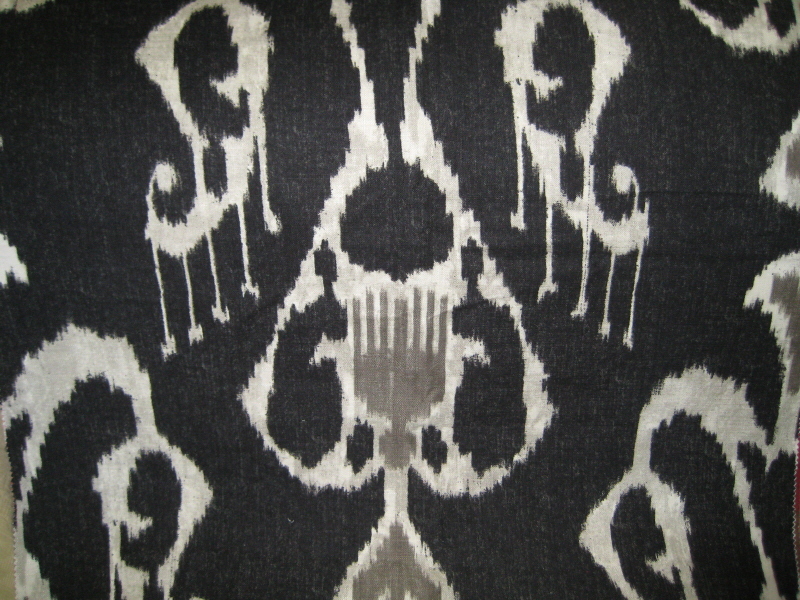 A characteristic of ikat textiles is an apparent “blurriness” to the design. The blurriness is a result of the extreme difficulty the weaver has lining up the dyed yarns so that the pattern comes out perfectly in the finished cloth. The blurriness can be reduced by using finer yarns or by the skill of the craftsperson. Ikats with little blurriness, multiple colours and complicated patterns are more difficult to create and therefore often more expensive. However, the blurriness that is so characteristic of ikat is often prized by textile collectors. 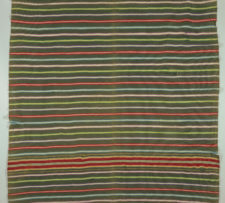 Ikat dyed silk warp, undyed cotton weft from Uzbekistan, Smithsonian Collections. 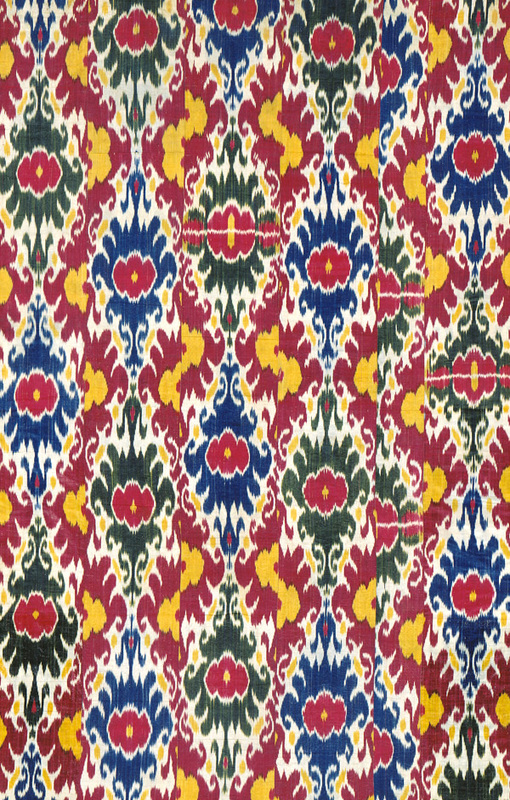 Indonesian ikat. Honolulu Museum of Art. 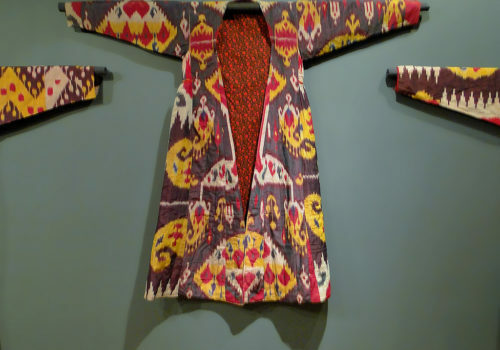 Ikat Robe. 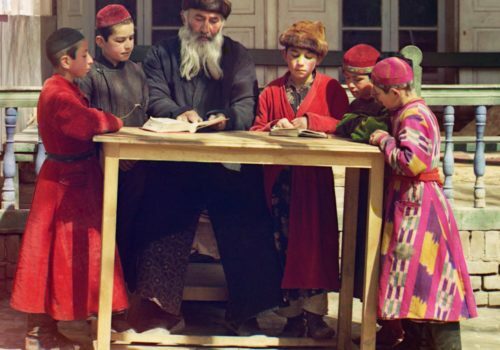 Jewish Children with their Teacher in Samarkand. 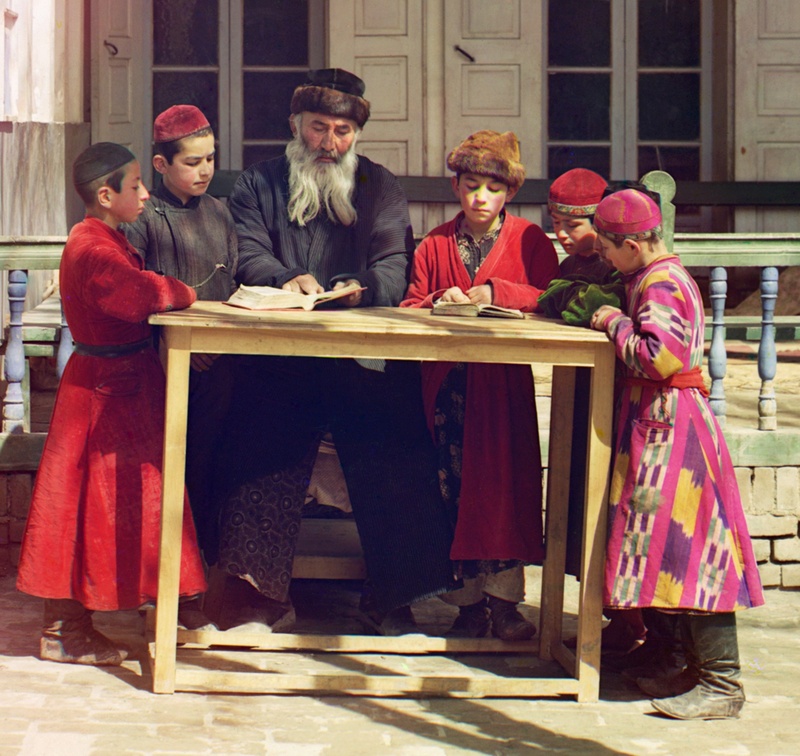 Early color photograph from Russia, created by Sergei Mikhailovich Prokudin-Gorskii as part of his work to document the Russian Empire from 1909 to 1915. Ikat is produced in many traditional textile centres around the world, from India to Central Asia, Southeast Asia, Japan (where it is called "kasuri"), Africa and Latin America. 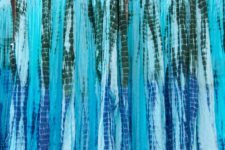 Double ikats—in which both the warp and weft yarns are tied and dyed before being woven into a single textile—are relatively rare because of the intensive skilled labour required to produce them. They are produced in Okinawa islands of Japan, the village of Tenganan in Indonesia, and the villages of Puttapaka and Bhoodan Pochampally in Telangana in India. In fact, many other parts of India have their indigenous Ikat weaving techniques. Orissa’s Sambalpuri Ikat is quite different from the sharp Ikat patterns, woven in Patan of Gujarat. The latter, known as Patan Patola, is one of the rarest forms of double Ikat, which takes a lot of time and effort in dyeing and weaving. A different form of Patola ikat is made in Rajkot, Gujarat. Telia Rumal made in Andhra, Pasapalli from Odisha and Puttapaka from Telangana are other Indian Ikats. In weft ikat it is the weaving or weft yarn that carries the dyed patterns. Therefore, the pattern only appears as the weaving proceeds. Weft ikats are much slower to weave than warp ikat because the weft yarns must be carefully adjusted after each passing of the shuttle to maintain the clarity of the design.In warp ikat it is only the warp yarns that are dyed using the ikat technique. The weft yarns are dyed a solid colour. The ikat pattern is clearly visible in the warp yarns wound onto the loom even before the weft is woven in. 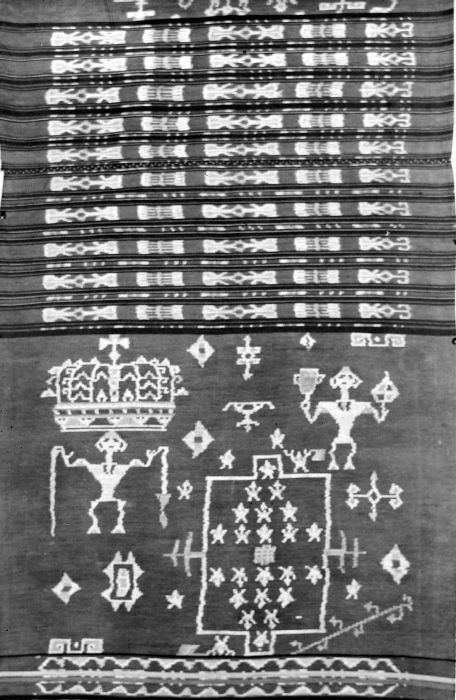 Warp ikat is, amongst others, produced in Indonesia; more specifically in Kalimantan, Sulawesi, and Sumatra by respectively the Dayaks, Torajans and Bataks. Double Ikat is a technique in which both warp and the weft are resist-dyed prior to weaving. Obviously it is the most difficult to make and the most expensive. Double ikat is only produced in three countries: India, Japan and Indonesia. The double ikat made in Patan, Gujarat in India is the most complicated. Called "patola," it is made using fine silk yarns and many colours. It may be patterned with a small motif that is repeated many times across the length of a six-meter sari. Sometimes the Patan double ikat is pictorial with no repeats across its length. That is, each small design element in each colour was individually tied in the warp and weft yarns. It's an extraordinary achievement in the textile arts. These much sought after textiles were traded by the Dutch East Indies company for exclusive spice trading rights with the sultanates of Indonesia. The double ikat woven in the small Bali Aga village, Tenganan in east Bali in Indonesia reflects the influence of these prized textiles. 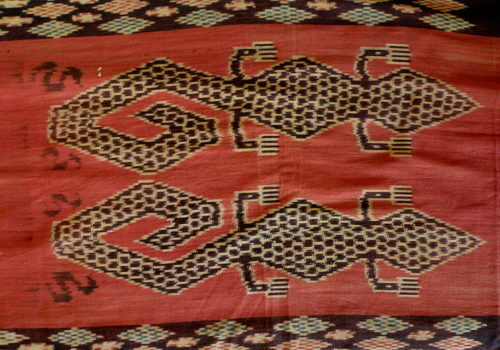 Some of the Tenganan double ikat motifs are taken directly from the patola tradition. In India double ikat is also woven in Puttapaka, Nalgonda District and is called Puttapaka Saree. [ In Japan, double ikat is woven in the Okinawa islands where it is called tate-yoko gasuri. Ikat created by dyeing the warp are simpler to make than either weft ikat or double ikat. First the yarns--cotton, silk, wool or other fibres—are wound onto a frame. Then they are tied into bundles. The bundles may be covered with wax, as in batik. (However, in making batik, the craftsperson applies the resist to the finished cloth rather than to the yarns to be woven.) The warp yarns are then wrapped tightly with thread or some other dye-resistant material to prevent unwanted dye permeation. The procedure is repeated, depending on the number of colours required to complete the design. Multiple coloration is common, requiring multiple rounds of tying and dyeing. The newly dyed and thoroughly washed bundles are wound onto the loom to produce the warp (longitudinal yarns). Warp threads are adjusted for the desired alignment for precise motifs. 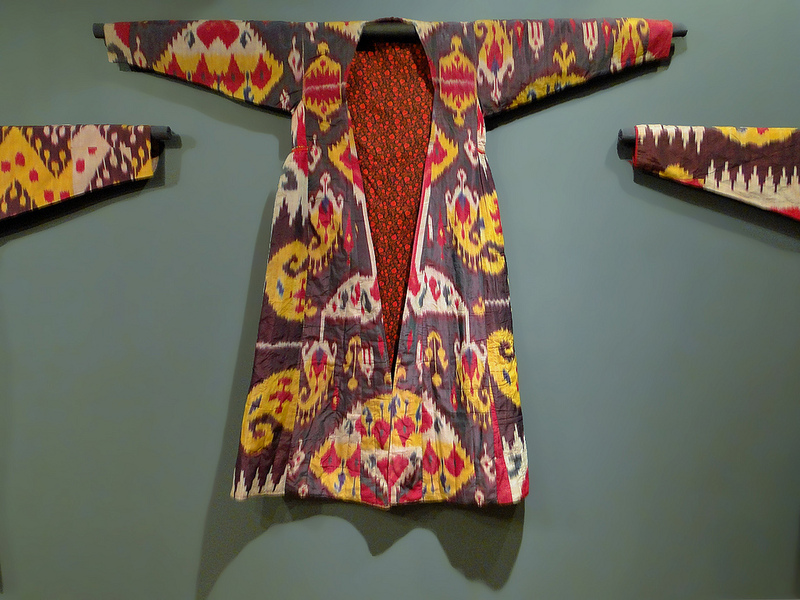 Some ikat traditions, such as Central Asia's, embrace a blurred aesthetic in the design. Other traditions favour a more precise and more difficult to achieve refinement in the placement of the ikat yarns. South American and Indonesian ikat are known for a high degree of warp alignment. Weavers must adjust the warp repeatedly to maintain pattern alignment. Patterns result from a combination of the warp dye and the weft thread colour. Some warp ikat traditions are designed with vertical-axis symmetry or have a "mirror-image" running along their long centre line. That is, whatever pattern or design is woven on the right is duplicated on the left in reverse order about a central warp thread group. Patterns can be created in the vertical, horizontal or diagonal. Nevertheless, highly skilled artisans can produce precise weft ikat. 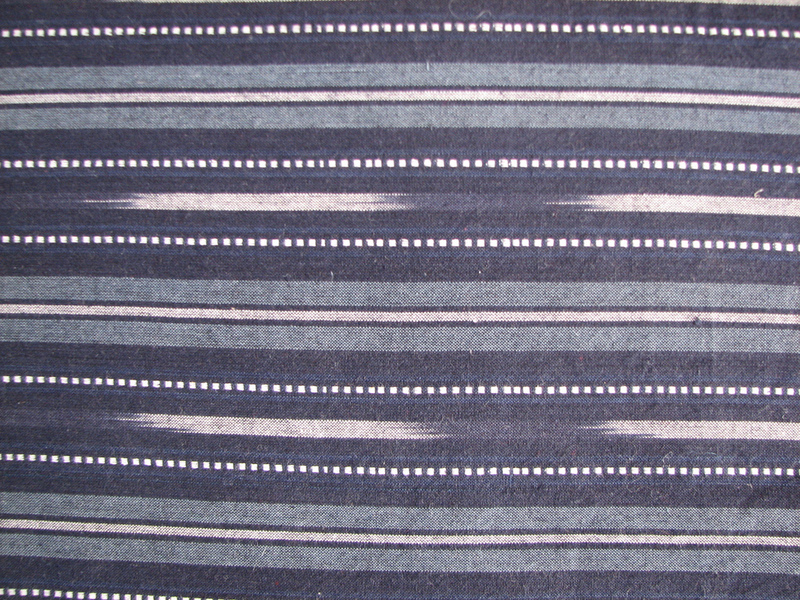 Japanese weavers produce very accurate indigo and white weft ikat with small scale motifs in cotton. 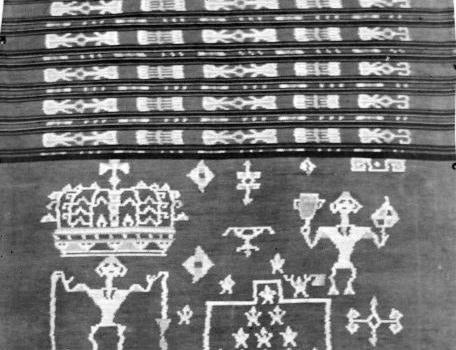 Weavers in Odisha, India have replicated fine Urdu script in weft ikat. In Thailand, weavers make very fine silk sarongs depicting birds and complex geometrical designs in seven colour weft ikat.Weft ikat uses resist-dyeing for the weft yarns. The movement of the weft yarns in the weaving process means precisely delineated patterns are more difficult to weave. The weft yarn must be adjusted after each passing of the shuttle to preserve the pattern. In some precise weft ikat traditions (Gujarat, India), two artisans weave the cloth: one passes the shuttle and the other adjusts the way the yarn lies in the shed. As the weft is commonly a continuous strand, aberrations or variation in coloration are cumulative. Some weft ikat traditions incorporate this affect into their aesthetic. Patterns become transformed by the weaving process into irregular and erratic designs. 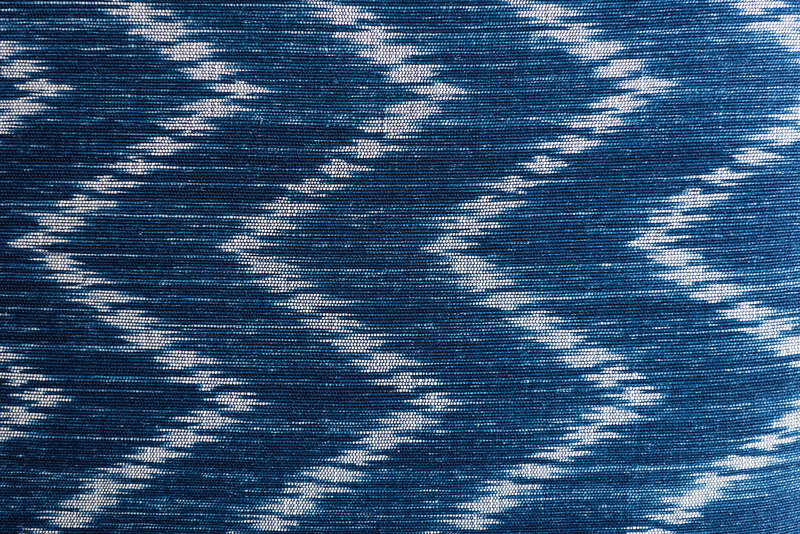 Guatemalan ikat is well-noted for its beautiful "blurs." Double Ikat is created by resist-dyeing both the warp and weft prior to weaving. This form of weaving requires the most skill for precise patterns to be woven and is considered the premiere form of ikat. The amount of labour and skill required also make it the most expensive, and many poor quality cloths flood the tourist markets. Indian and Indonesian examples typify highly precise double ikat. Especially prized are the double ikats woven in silk known in India as patola (singular: patolu). These are from Gujarat (Cambay). During the colonial era, Dutch merchants used patola as prestigious trade cloths during the peak of the spice trade. 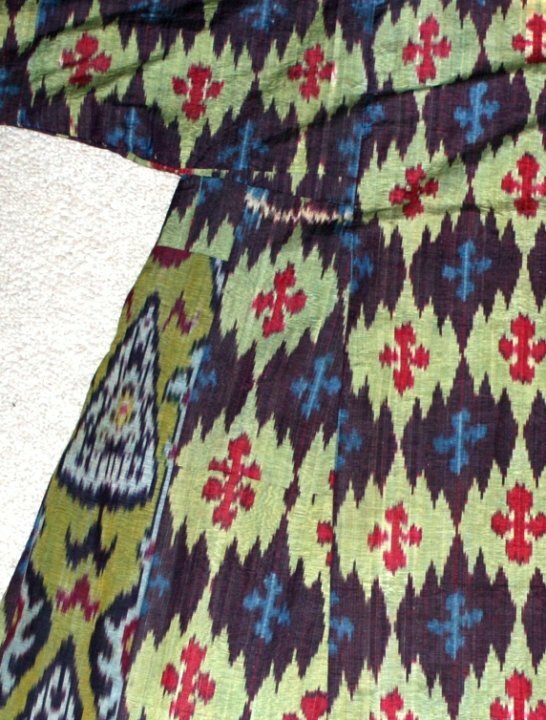 In Indonesia double ikat is only woven in the Bali Aga village of Tenganan. These cloths have high spiritual significance. In Tenganan they are still worn for specific ceremonies. Outside Tenganan, geringsing are treasured as they are purported to have magical powers. The double ikat of Japan is woven in the Okinawa islands and is called tate-yoko gasuri. Pochampally Sari, a variety from a small village in Nalgonda district, Andhra Pradesh, India is known for silk saris woven in the double Ikat. The Puttapaka Saree is made in Puttapaka village, Samsthan Narayanpuram mandal in Nalgonda district, India. It is known for its unique style of silk saris. The symmetric design is over 200 years old. The Ikat is warp-based. The Puttapaka Saree is a double ikat. Before the weaving is done, a manual winding of yarn, called Asu, needs to be performed. This process takes up to 5 hours per sari and is usually done by the womenfolk, who suffer physical strain through constantly moving their hands back and forth over 9000 times for each sari. In 1999, a young weaver C Mallesham developed a machine which automated Asu, thus developing a technological solution for a decades-old unsolved problem. Ikat is an Indonesian language word, which depending on context, can be the nouns: cord, thread, knot and the finished ikat fabric as well as the verbs "to tie" or "to bind". It has a direct etymological relation to Javanese language of the same word. Thus, the name of the finished ikat woven fabric originates from the tali (threads, ropes) being ikat (tied, bound, knotted) before they are being put in celupan (dyed by way of dipping), then berjalin (woven, intertwined) resulting in a berjalin ikat- reduced to ikat. 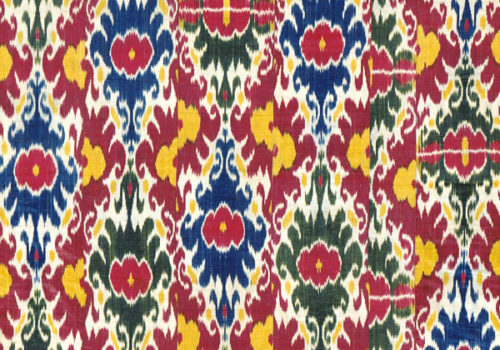 The introduction of the term ikat into European language is attributed to Rouffaer. Ikat is now a generic English loanword used to describe the process and the cloth itself regardless of where the fabric was produced or how it is patterned. In Indonesian the plural of ikat remains ikat. However, in English a suffix plural 's' is commonly added, as in ikats. This is true in other some other languages. All are correct. 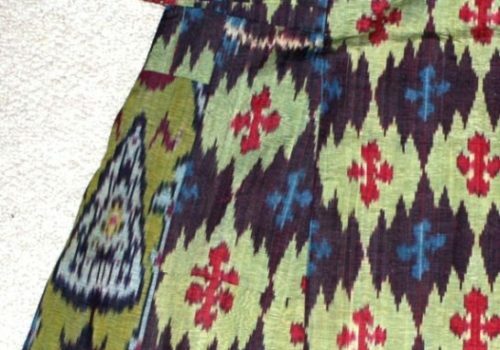 As textiles do not last well through history, scholars have so far been unable to determine where the technique of ikat originated. Nevertheless, some parts of Asia demonstrates strong ikat traditions which suggest its possible origin; they are Maritime Southeast Asia, Indian subcontinent and Central Asia. However, it probably developed in several different locations independently, since ikat was known to be produced in several pre-Columbian Central and South American cultures. 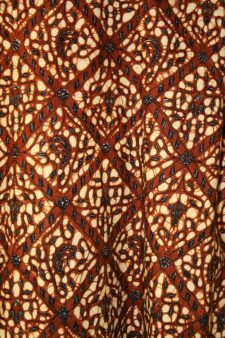 The term "ikat" has Indonesian origin, and it was introduced into European textile vocabulary back in early 20th century, when the Dutch scholars begin to study the rich textile traditions of East Indies archipelago (today Indonesia). Uyghurs call it atlas (in IPA [ɛtlɛs]) and use it only for woman's clothing. The historical record indicates that there were 27 types of atlas during Qing occupation. Now there are only four types of Uyghur atlas remaining: Qara-atlas (Darayi, black ikat used for older women's clothing), Khoja'e-atlas (yellow, blue, purple ikat used for married women), Qizil-atlas (red ikat used for girls) and Yarkant-atlas (Khan-atlas). Yarkant-atlas has more diverse styles; during Yarkant Khanate (16th century), there ten different styles of Yarkant-atlas. Ikat is a weaving style common to many world cultures. It is probably one of the oldest forms of textile decoration. However, it is most prevalent in Indonesia, India and Japan. In Central and South America, ikat is still common in Argentina, Bolivia, Ecuador, Guatemala and Mexico. 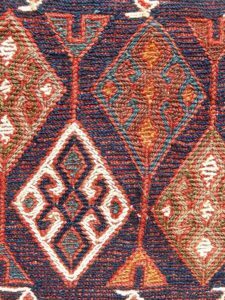 In the 19th century, the Silk Road desert oases of Bukhara, Samarkand, Hotan and Kashgar (in what is now Uzbekistan and Xinjiang in Central Asia) were famous for their fine silk Uzbek/Uyghur ikat. India, Japan, Indonesia and many other Southeast Asian nations including Cambodia, Myanmar, Philippines and Thailand have weaving cultures with long histories of ikat production. Double ikat weaving is still found in India, Japan and Indonesia. In Indonesia, it is still woven in Bali, Java, Kalimantan or Borneo and Sumatra. 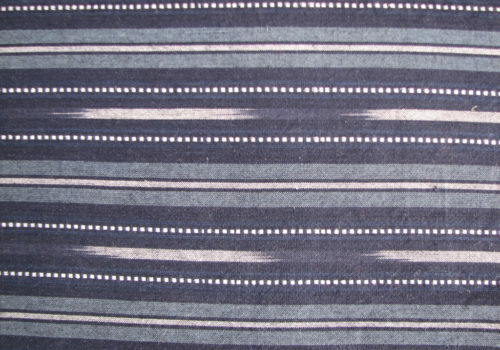 Oshima ikat is a uniquely Japanese ikat. In Oshima, the warp and weft threads are both used as warp to weave stiff fabric, upon which the thread for the ikat weaving is spot-dyed. Then the mats are unravelled and the dyed thread is woven into oshima cloth. The Oshima process is duplicated in Java and Bali, and is reserved for ruling royalty, notably Klungkung and Ubud: most especially the dodot cloth semi-cummerbund of Javanese court attire. The Cambodian ikat is a weft ikat woven of silk on a multi-shaft loom with an uneven twill weave, which results in the weft threads showing more prominently on the front of the fabric than the back. By the 19th century, Cambodian ikat was considered among the finest textiles of the world. 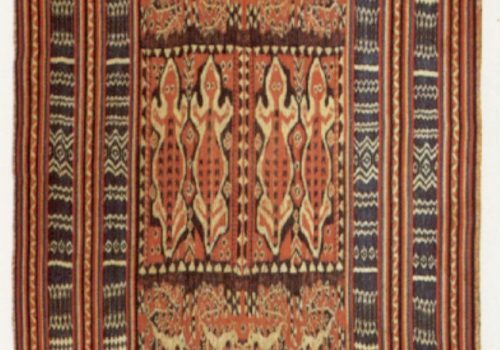 When the King of Thailand came to the US in 1856, he brought as a gift for President Franklin Pierce fine Cambodian ikat cloth. The most intricately patterned of the Cambodian fabrics are the sampot hol—skirts worn by the women—and the pidans—wall hangings used to decorate the pagoda or the home for special ceremonies. Unfortunately, Cambodian culture suffered massive disruption and destruction during the mid-20th century Indochina wars but most especially during the Khmer Rouge regime. Most weavers were killed and the whole art of Cambodian ikat was in danger of disappearing. Kikuo Morimoto is a prominent pioneer in re-introducing ikat to Cambodia. In 1995, he moved from Japan and located one or two old lady weavers and Khmer Rouge survivors who knew the art and have taught it to a new generation. In Thailand, the local weft ikat type of woven cloth is known as Matmi (also spelled 'Mudmee' or 'Mudmi'). Traditional Mudmi cloth was woven for daily use among the nobility. Other uses included ceremonial costumes. Warp ikat in cotton is also produced by the Karen and Lawa tribal peoples in northern Thailand. This type of cloth is the favourite silk item woven by ethnic Khmer people living in southern Isaan, mainly in Surin, Sisaket and Buriram. The Mexican rebozos can be made from silk, wool or cotton and are frequently ikat dyed. 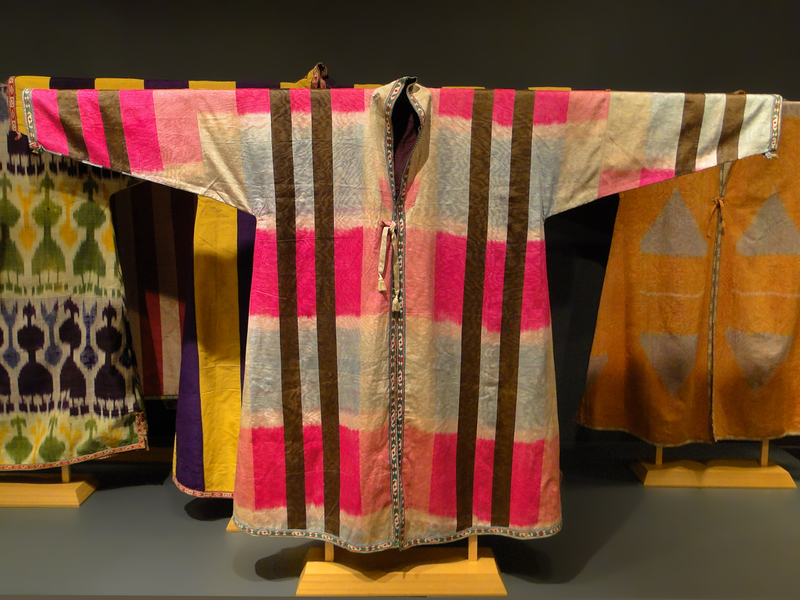 These shawls are seen as a part of the Mexican national identity and most women own at least one.Ikat patterns are common among the Andes peoples, and native people of Argentina, Bolivia, Brazil, Chile, Colombia, Ecuador, Guatemala, Mexico, Peru, and Venezuela. The Mapuche shawl or poncho of the Huaso cowboys of Chile is perhaps the item best known in the West. Wool and cabuya fibre are the most commonly used. 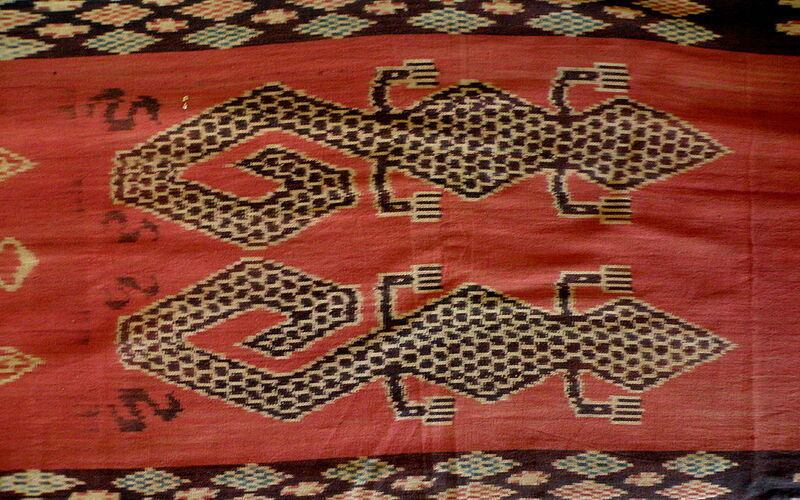 Latin American ikat (Jaspe, as it is known to Maya weavers) textiles are commonly woven on a back-strap loom. Pre-dyed warp threads are a common item in traditional markets- saving the weaver much mess, expense, time and labour. A Latin American innovation which may also be employed elsewhere is to employ a round stick around which warp threads are wrapped in groups, thus allowing more precise control of the desired design. The "corte" is the typical wrap skirt used worn by Guatemalan women. “Weaving a Puttapaka tradition – The Hindu”. hindu.com. Retrieved 30 August 2014. “Other parts of India have their indigenous Ikat weaving techniques”. 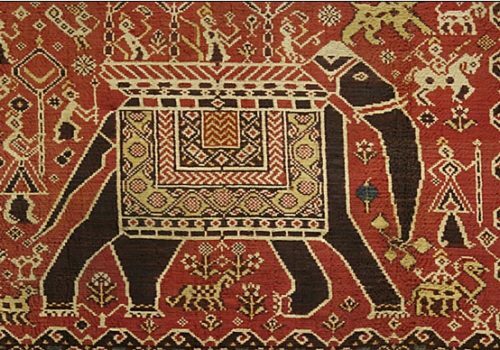 “APonline – History and Culture-Arts and Crafts – Ikat”. aponline.gov.in. Retrieved 30 August 2014. ^ a b Ruth Barnes. “Ikat”. Love to Know. ^ Guy, John. 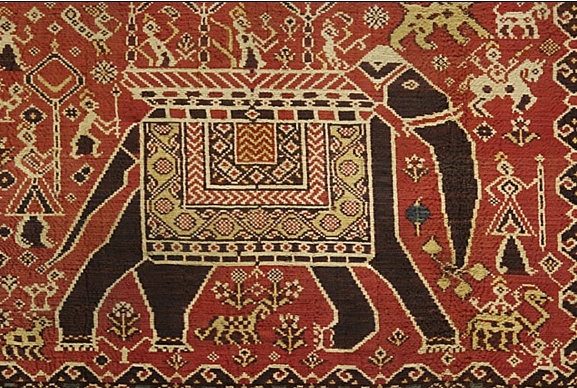 Indian Textiles in the East. London, Thames & Hudson, 2009, pp. 10, 24. ^ “Textiles”. indiaheritage.org. Retrieved 30 August 2014. “Batik, Wayang, Keris: Jadi Warisan Budaya Dunia“. Indonesian. Antara News Indonesia. Retrieved 3 May 2010. This article uses material from the Wikipedia article Ikat, which is released under the Creative Commons Attribution-ShareAlike 3.0 Unported License.